This article introduces the basic concepts of binary trees, and then works through a series of practice problems with solution code in C/C++ and Java. Binary trees have an elegant recursive pointer structure, so they are a good way to learn recursive pointer algorithms. A binary tree is made of nodes, where each node contains a "left" pointer, a "right" pointer, and a data element. The "root" pointer points to the topmost node in the tree. The left and right pointers recursively point to smaller "subtrees" on either side. A null pointer represents a binary tree with no elements -- the empty tree. The formal recursive definition is: a binary tree is either empty (represented by a null pointer), or is made of a single node, where the left and right pointers (recursive definition ahead) each point to a binary tree. A "binary search tree" (BST) or "ordered binary tree" is a type of binary tree where the nodes are arranged in order: for each node, all elements in its left subtree are less-or-equal to the node (<=), and all the elements in its right subtree are greater than the node (>). 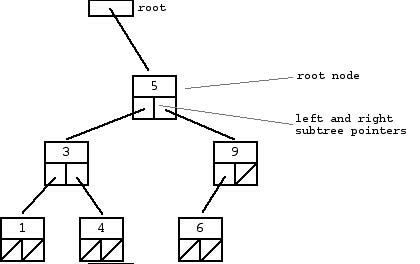 The tree shown above is a binary search tree -- the "root" node is a 5, and its left subtree nodes (1, 3, 4) are <= 5, and its right subtree nodes (6, 9) are > 5. Recursively, each of the subtrees must also obey the binary search tree constraint: in the (1, 3, 4) subtree, the 3 is the root, the 1 <= 3 and 4 > 3. Watch out for the exact wording in the problems -- a "binary search tree" is different from a "binary tree". The nodes at the bottom edge of the tree have empty subtrees and are called "leaf" nodes (1, 4, 6) while the others are "internal" nodes (3, 5, 9). Basically, binary search trees are fast at insert and lookup. The next section presents the code for these two algorithms. On average, a binary search tree algorithm can locate a node in an N node tree in order lg(N) time (log base 2). Therefore, binary search trees are good for "dictionary" problems where the code inserts and looks up information indexed by some key. The lg(N) behavior is the average case -- it's possible for a particular tree to be much slower depending on its shape. When thinking about a binary tree problem, it's often a good idea to draw a few little trees to think about the various cases. As an introduction, we'll look at the code for the two most basic binary search tree operations -- lookup() and insert(). The code here works for C or C++. 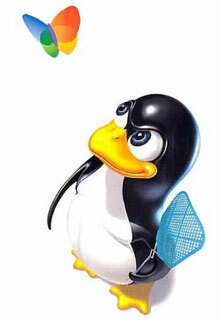 Java programers can read the discussion here, and then look at the Java versions in Section 4. Given a binary search tree and a "target" value, search the tree to see if it contains the target. The basic pattern of the lookup() code occurs in many recursive tree algorithms: deal with the base case where the tree is empty, deal with the current node, and then use recursion to deal with the subtrees. If the tree is a binary search tree, there is often some sort of less-than test on the node to decide if the recursion should go left or right. branch by comparing the target to each node. The lookup() algorithm could be written as a while-loop that iterates down the tree. Our version uses recursion to help prepare you for the problems below that require recursion. We take the value returned by change(), and use it as the new value for root. This construct is a little awkward, but it avoids using reference parameters which confuse some C and C++ programmers, and Java does not have reference parameters at all. This allows us to focus on the recursion instead of the pointer mechanics. (For lots of problems that use reference parameters, see CSLibrary #105, Linked List Problems, http://cslibrary.stanford.edu/105/). The solution shown here introduces a newNode() helper function that builds a single node. The base-case/recursion structure is similar to the structure in lookup() -- each call checks for the NULL case, looks at the node at hand, and then recurs down the left or right subtree if needed. struct node* node = new(struct node); // "new" is like "malloc"
with the given number in the correct place in the tree. The shape of a binary tree depends very much on the order that the nodes are inserted. In particular, if the nodes are inserted in increasing order (1, 2, 3, 4), the tree nodes just grow to the right leading to a linked list shape where all the left pointers are NULL. A similar thing happens if the nodes are inserted in decreasing order (4, 3, 2, 1). The linked list shape defeats the lg(N) performance. We will not address that issue here, instead focusing on pointers and recursion. Here are 14 binary tree problems in increasing order of difficulty. Some of the problems operate on binary search trees (aka "ordered binary trees") while others work on plain binary trees with no special ordering. The next section, Section 3, shows the solution code in C/C++. Section 4 gives the background and solution code in Java. The basic structure and recursion of the solution code is the same in both languages -- the differences are superficial. Reading about a data structure is a fine introduction, but at some point the only way to learn is to actually try to solve some problems starting with a blank sheet of paper. To get the most out of these problems, you should at least attempt to solve them before looking at the solution. Even if your solution is not quite right, you will be building up the right skills. With any pointer-based code, it's a good idea to make memory drawings of a a few simple cases to see how the algorithm should work. This problem demonstrates simple binary tree traversal. Given a binary tree, count the number of nodes in the tree. Given a binary tree, compute its "maxDepth" -- the number of nodes along the longest path from the root node down to the farthest leaf node. The maxDepth of the empty tree is 0, the maxDepth of the tree on the first page is 3. Given a non-empty binary search tree (an ordered binary tree), return the minimum data value found in that tree. Note that it is not necessary to search the entire tree. A maxValue() function is structurally very similar to this function. This can be solved with recursion or with a simple while loop. Produces the output "1 2 3 4 5". This is known as an "inorder" traversal of the tree. Hint: For each node, the strategy is: recur left, print the node data, recur right. Produces the output "1 3 2 5 4". The description is complex, but the code is simple. This is the sort of bottom-up traversal that would be used, for example, to evaluate an expression tree where a node is an operation like '+' and its subtrees are, recursively, the two subexpressions for the '+'. For this problem, we will be concerned with the sum of the values of such a path -- for example, the sum of the values on the 5-4-11-7 path is 5 + 4 + 11 + 7 = 27. Given a binary tree, print out all of its root-to-leaf paths, one per line. Change a tree so that the roles of the left and right pointers are swapped at every node. The solution is short, but very recursive. As it happens, this can be accomplished without changing the root node pointer, so the return-the-new-root construct is not necessary. Alternately, if you do not want to change the tree nodes, you may construct and return a new mirror tree based on the original tree. For each node in a binary search tree, create a new duplicate node, and insert the duplicate as the left child of the original node. The resulting tree should still be a binary search tree. Suppose you are building an N node binary search tree with the values 1..N. How many structurally different binary search trees are there that store those values? Write a recursive function that, given the number of distinct values, computes the number of structurally unique binary search trees that store those values. For example, countTrees(4) should return 14, since there are 14 structurally unique binary search trees that store 1, 2, 3, and 4. The base case is easy, and the recursion is short but dense. Your code should not construct any actual trees; it's just a counting problem. For the first two cases, the right answer can be seen just by comparing each node to the two nodes immediately below it. However, the fourth case shows how checking the BST quality may depend on nodes which are several layers apart -- the 5 and the 6 in that case. Returns true if a binary tree is a binary search tree. Version 1 above runs slowly since it traverses over some parts of the tree many times. A better solution looks at each node only once. The trick is to write a utility helper function isBSTRecur(struct node* node, int min, int max) that traverses down the tree keeping track of the narrowing min and max allowed values as it goes, looking at each node only once. The initial values for min and max should be INT_MIN and INT_MAX -- they narrow from there. /* Returns true if the given tree is a binary search tree (efficient version). values are >= min and <= max. The Tree-List problem is one of the greatest recursive pointer problems ever devised, and it happens to use binary trees as well. CLibarary #109 http://cslibrary.stanford.edu/109/ works through the Tree-List problem in detail and includes solution code in C and Java. The problem requires an understanding of binary trees, linked lists, recursion, and pointers. It's a great problem, but it's complex. Make an attempt to solve each problem before looking at the solution -- it's the best way to learn. Build 123 by calling insert() three times. Note that the '2' must be inserted first. Compute the number of nodes in a tree. the longest path from the root node down to the farthest leaf node. return the minimum data value found in that tree. Note that the entire tree does not need to be searched. nodes according to the "bottom-up"
and check to see if the sum is 0 when you run out of tree. paths, one per line. Uses a recursive helper to do the work. print out all the root-leaf paths. // Utility that prints out an array on a line. left and right pointers are swapped at every node. the duplicate as the left child of the original node. The resulting tree should still be a binary search tree. binary search trees are possible that store those keys. Strategy: consider that each value could be the root. Recursively find the size of the left and right subtrees. // on the left and right each forming their own subtrees. In Java, the key points in the recursion are exactly the same as in C or C++. In fact, I created the Java solutions by just copying the C solutions, and then making the syntactic changes. The recursion is the same, however the outer structure is slightly different. In Java, we will have a BinaryTree object that contains a single root pointer. The root pointer points to an internal Node class that behaves just like the node struct in the C/C++ version. The Node class is private -- it is used only for internal storage inside the BinaryTree and is not exposed to clients. With this OOP structure, almost every operation has two methods: a one-line method on the BinaryTree that starts the computation, and a recursive method that works on the Node objects. For the lookup() operation, there is a BinaryTree.lookup() method that the client uses to start a lookup operation. Internal to the BinaryTree class, there is a private recursive lookup(Node) method that implements the recursion down the Node structure. This second, private recursive method is basically the same as the recursive C/C++ functions above -- it takes a Node argument and uses recursion to iterate over the pointer structure. // Root node pointer. Will be null for an empty tree. The binary tree is built using this nested node class. sub-tree pointer which may be null. storage; it does not have any methods. Creates an empty binary tree -- a null root pointer. Returns true if the given target is in the binary tree. down searching for the given data. Inserts the given data into the binary tree. a changed pointer back to the caller). From the client point of view, the BinaryTree class demonstrates good OOP style -- it encapsulates the binary tree state, and the client sends messages like lookup() and insert() to operate on that state. Internally, the Node class and the recursive methods do not demonstrate OOP style. The recursive methods like insert(Node) and lookup (Node, int) basically look like recursive functions in any language. In particular, they do not operate against a "receiver" in any special way. Instead, the recursive methods operate on the arguments that are passed in which is the classical way to write recursion. My sense is that the OOP style and the recursive style do not be combined nicely for binary trees, so I have left them separate. Merging the two styles would be especially awkward for the "empty" tree (null) case, since you can't send a message to the null pointer. It's possible to get around that by having a special object to represent the null tree, but that seems like a distraction to me. I prefer to keep the recursive methods simple, and use different examples to teach OOP. Here are the Java solutions to the 14 binary tree problems. Most of the solutions use two methods:a one-line OOP method that starts the computation, and a recursive method that does the real operation. Make an attempt to solve each problem before looking at the solution -- it's the best way to learn. Build 123 using three pointer variables. Build 123 using only one pointer variable. Returns the number of nodes in the tree. down the tree and counts the nodes. Returns the max root-to-leaf depth of the tree. Returns the min value in a non-empty binary search tree. Finds the min value in a non-empty binary search tree. Prints the node values in the "inorder" order. Uses a recursive helper to do the traversal. Prints the node values in the "postorder" order. prints out all the root-leaf paths. Utility that prints ints from an array on one line. Changes the tree into its mirror image. see if they are structurally identical. checking to see if they are identical. binary search trees are possible that store those keys? using minValue() and maxValue() (not efficient). // agree with the node? visits each node only once.